A man and a woman stand at a lectern near a microphone. The man holds a flat object in his right hand. Man at lectern: Sorry, we can’t disclose which operating system we’re using. The next panel shows a more distant view of the man and the woman at the lectern. It is seen that they are standing on a raised platform. An audience is in attendance. The man at the lectern gesticulates with his arms and with the object in his hand. Man at lectern: That would make it too easy for other hackers. 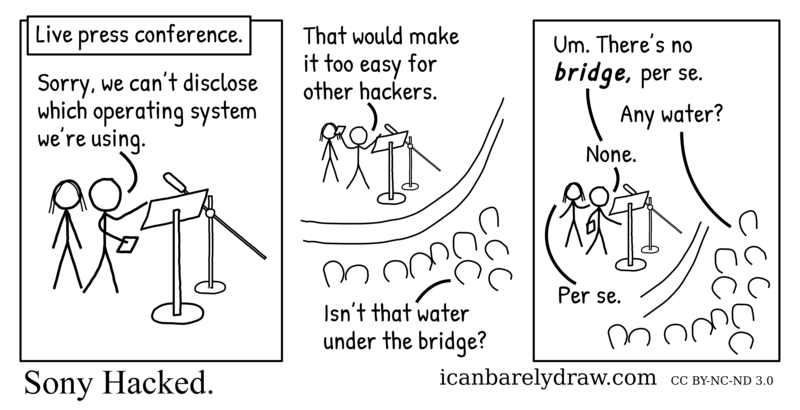 Member of audience: Isn’t that water under the bridge? Rhe next and final panel shows the same scene, in a slightly closer view. Man at lectern: Um. There’s no bridge, per se. Another member of audience: Any water? Woman at lectern: Per se.